Description: It was a beautiful day, and the sun was shining down on the Habitarium. It wasn't an ordinary group of pests by the nests, however. It was an invasion from another Habitarium. Description: The quickest way to help the pets of the pound one pet at a time! Description: The north beach had always seemed a bit spooky, especially that little cave. . . Description: Have you ever wondered how the golden quill trophies came to be? Here's the story. Description: While the other Unis sat around grooming all day, Hlaoa had a different idea of how to have fun. Description: Do you want to see your Shoyru's face light up in surprise and delight when they see their meal? Here's your guide! Description: I thought my life would end with Tae by my side, but then again, I thought it began that way, too. Description: Users nowadays put too much value on special paint brush colors and rare species. Description: We've all been bored at one point, but if you read this guide, then you'll have twelve ways to cure it! Description: Three faeries, three different opinions! 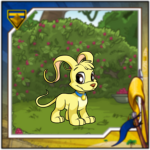 It's that time of year again - Fyora Day! With the help of this article, it is our hope that Quiggles will never go hungry!